A few days after a 110-pound light fixture crashed from the ceiling of the Tip O’Neill tunnel onto one of the busiest roads in Boston, a highway crew made an alarming discovery: nine other lights in the sprawling Big Dig tunnels were hanging from supports so corroded that they could fail at any time, too. The Big Dig already had a tragic experience with dangerous falling objects. A tunnel ceiling panel had collapsed in 2006, killing a woman a few hundred yards from where the nine corroded fixtures were discovered on Feb. 16. State engineers had no way of knowing how many more of the 25,000 lights in the Big Dig tunnels had become unstable - and plenty of reason to fear that corrosion was widespread after years of saltwater leaking into the tunnels. But the engineers in charge kept quiet. They filed no written report. They didn’t brief their boss. And when they asked federal regulators for money to fix a corrosion problem that “could’’ lead to falling light fixtures, they didn’t disclose that one had already fallen. Internal e-mails and Transportation Department reports obtained by the Globe show that last winter’s light fixture collapse presented a more hazardous situation than Secretary Jeffrey B. Mullan disclosed to the public, and one that could add $200 million to the already-gargantuan price of the Big Dig. State records also show that his agency’s attempt to solve the problem was both more secretive and sluggish than he admitted. Engineers, led by Mullan’s close associate Helmut Ernst, didn’t even send the fallen fixture to a lab for analysis until March 16, instead leaving the crucial piece of evidence in a South Boston maintenance facility along with mounds of road debris. “I have to ask what we have been doing for six weeks. No testing yet?’’ lamented Mullan in an e-mail hours before a March 16 press conference where he belatedly told the public about the light fixture hazard in the tunnels. Despite these private doubts, Mullan told reporters he and his staff had “spent quite some time’’ investigating the incident and that he was disclosing it after getting “a better idea of exactly what we were dealing with.’’ He said they had deliberately kept the incident quiet to avoid panic while they worked. Mullan’s story crumbled a few days later when he admitted that he didn’t even know about the light collapse until a month after it happened. As word spread that Mullan’s job might be in jeopardy, Mullan forced someone else out instead. Not Ernst, his former first deputy, but Frank Tramontozzi, who was Ernst’s supervisor while the state highway administrator was on family leave. Mullan concluded that Tramontozzi, not Ernst, was most responsible for leaving him in the dark on an important safety issue. Ernst, who received a letter of reprimand in the incident, said Tramontozzi didn’t deserve to be fired, and he questions Mullan’s current claim that he didn’t know about the corrosion problem for a month. Mullan, who has previously admitted he “mismanaged’’ public disclosure of the fallen light fixture, also said he never believed his job was in jeopardy. The light fixture fiasco underscores a culture of secrecy among the engineers who maintain the $22 billion Big Dig, one of the world’s most costly - and problem-plagued - highway projects. After years of scandals, bad press, and lawsuits alleging shoddy work, engineers freely admit they don’t like to write things down, prompting one transportation consultant to compare the atmosphere to President Nixon’s White House. Whatever the cause, Ernst said last week that all 25,000 lights ultimately have to be replaced and the tunnels rewired, a project that could cost $200 million. For now, crews are securing the lights with plastic straps that they began installing three weeks ago. The 8-foot-long light fixture lying in the northbound lane of Interstate 93 after morning rush hour on Feb. 8 was just another piece of road debris to the maintenance worker who discovered it. Had he looked up at the tunnel ceiling, he would have seen a gap in the line of gleaming lights where the fixture had hung until perhaps a few minutes earlier, evidence of a clear public danger. But, with no witnesses and no apparent damage or injuries, the light went in the back of his truck on its way to the junkyard. 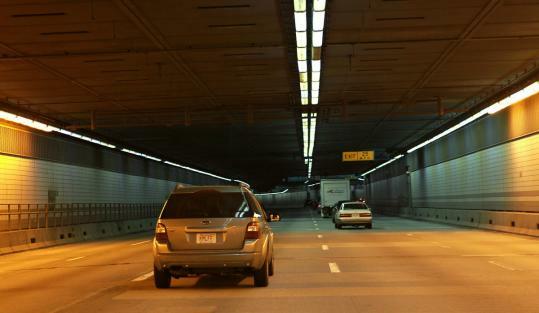 An electrician who saw the scrapped light the next day realized its significance, triggering an inspection of lights throughout the O’Neill, Ted Williams, and other Big Dig tunnels. But from the start, the review went forward at a sputtering pace. During the first week, transportation records show that crews examined fewer than 1,100 of the 25,000 lights, taking three nights off from inspections entirely. The inspectors initially found that 3.3 percent of the metal clips that fasten lights to the ceiling were pulling loose due to corrosion - which was concerning enough - but on Feb. 16 one crew found a hot spot where all the fastening clips were corroded on nine lights, nearly 1,000 pounds of precariously balanced fixtures hanging over motorists’ heads. The crew adjusted all 90 clips holding up the lights so that they were attached to uncorroded metal. Now, Mullan and two deputies dispute the gravity of the discovery, suggesting that the workers may have found dirt and debris in the fixtures rather than corrosion and that they were confused. They said a crew is reinspecting lights throughout the 7.5 miles of Big Dig tunnels to more carefully document the corrosion. However, the crew’s February field report was unambiguous, finding that all the clips on the nine lights had “considerable corrosion with many unattached’’ to the tunnel ceiling. There is no evidence in the field reports that anyone questioned the finding. State policy requires that engineers make a written report of potential safety problems, triggering e-mail and text message alerts to transportation leaders, but that didn’t happen here. Ernst explained that engineers have become wary of writing things down since the 2006 ceiling collapse that killed Milena Del Valle because written records can become fodder for lawsuits. But Mullan denied that people in his agency avoid writing reports. “It may be an old practice at the Turnpike Authority,’’ he said, the agency that formerly ran the Big Dig. Ernst claims that he verbally briefed both Tramontozzi and other managers early on, but others sharply contest those claims. Tramontozzi insists he didn’t learn of the light fixture problem until Feb. 28, despite Ernst’s claim that he called Tramontozzi on the afternoon of Feb. 9 - one day after the light fixture fell - to brief him. Phone records reviewed by the Globe show that Tramontozzi called Ernst, not vice versa. Ernst also claimed he brought up the light problem at a Feb. 14 meeting of the highway division’s senior staff. But seven staffers at the meeting, including one who took notes, said they didn’t remember Ernst doing so when questioned later by a transportation lawyer at Mullan’s request. Out in the field, inspectors plugged along through February, examining one third of Big Dig lights and finding corrosion in about 2 percent of fixtures, though some areas had twice that much corrosion. Meanwhile, 250,000 vehicles a day drove through the tunnels, drivers blithely unaware of the hazard overhead. The engineers believed that salt was causing the light fixture corrosion, but they were unsure whether the salt had sprayed up from the roads in winter or came in with all the saltwater that floods the soil around all of the tunnels. That second possibility worried the engineers because saltwater had already done so much damage. The ongoing light inspections suggested that ocean water was at least partially to blame. Much of the corrosion, including the fallen fixture, was within 700 feet of tunnel entrances - where road salt would presumably be a factor - but one of the most corroded areas was deep inside the O’Neill tunnel where saltwater intrusion has long been a major problem. Meanwhile, the fallen light fixture that might give the engineers a better sense of what was causing the corrosion continued to lay in a maintenance facility. The issue finally reached Secretary Mullan’s desk in early March - according to the official record - when the discussion turned to money. One of Mullan’s political aides had heard Ernst talk about the corrosion problem and he followed up with an e-mailed question: How many lights need to be replaced? “This is a big deal and I don’t want to minimize the magnitude of the issue . . . About five percent of [light fixtures] checked so far are showing advanced deterioration to the point they are no longer safe.’’ Replacing all the lights, Ernst continued, could cost $200 million. The message quickly went up the chain of command to Mullan, who got a face-to-face briefing from Tramontozzi on March 8. Three days later, Mullan informed the governor’s office, according to e-mail and interviews. But Mullan waited another eight days before telling the public, and only after he received an urgent message from Governor Deval Patrick, then on a trade mission in London. Both Mullan and Tramontozzi said Patrick wanted the issue made public immediately. “Get this out before I get home,’’ Tramontozzi remembers Patrick saying to Mullan in a conference call on the 15th. Once Mullan got involved, the investigation quickened: the number of crews inspecting lights increased, and the Transportation Department finally sent a letter of concern to the company that manufactured the fixtures. The fallen light was finally shipped off to a lab in West Boylston. But legislators and other critics hammered Mullan for withholding public safety information for so long. The next day, Mullan sent a lengthy, self-justifying e-mail to Landolfi, arguing that the corrosion did not represent “a systemic problem or public danger’’ and that his employees moved “quickly and aggressively’’ to address it. On the same day, Landolfi sent an e-mail thanking Tramontozzi and other top officials for their help in what he initially viewed as a successful press conference. But the controversy wasn’t over even after Mullan admitted it was a mistake to delay public notification and promised “it won’t happen again.’’ Later in the week, Mullan told the Globe that he had misled the public in his press conference, taking the blame for reporting delays when in fact he had not even known about the fallen light for weeks. Instead of resigning, however, Mullan asked his deputy general counsel Robert Horacek to find out who was to blame for not telling him the whole story. Tramontozzi was a lower-profile manager who had come to the Transportation Department from the city of Boston. He became acting Highway Administrator in early March when his predecessor had taken a leave to care for her ailing husband, making him second only to Mullan. But Tramontozzi had none of the connections and cachet of Ernst, who occasionally went straight to Mullan with issues, bypassing Tramontozzi altogether, Tramontozzi said. Phone records show that Mullan talked to Ernst for 16 minutes on Saturday, March 19, the day after Mullan launched the investigation into communication failures in which Ernst had played a central role. Mullan acknowledged that the two talked about the light fixture issue, but said they didn’t discuss Horacek’s investigation. The following Monday, Horacek interviewed Ernst and two of his deputies, who said the same thing: Ernst telephoned Tramontozzi on Feb. 9 to brief the highway administrator about the fallen light. If true - and Tramontozzi denies it - that phone call made Tramontozzi the most senior official to know there was a problem with the lights from the beginning. Horacek’s finding was enough for Mullan to force him out. Tramontozzi said he didn’t think to check the phone records waved in his face as proof he was lying about the Feb. 9 call, which the Globe later obtained under the state public record law. The records show that Tramontozzi called Ernst on Feb. 9 but not vice versa, undermining the premise for firing Tramontozzi. But three days later, Tramontozzi got a call from Ken Weber in human resources. He had bad news about Tramontozzi’s vacation time. “We can’t do it. It would be a bad news story,’’ Tramontozzi recalls Weber telling him, in reference to the bad publicity that would come if reporters found out. Though Ernst kept his job, he came away disillusioned. He said no one should have been fired and he predicts that Big Dig engineers will be even more wary about taking action in the future. Sean Murphy can be reached at smurphy@globe.com. Scott Allen can be reached at allen@globe.com.